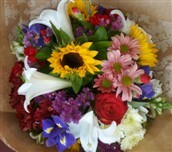 WE SEND AND DELIVER FLOWERS TO ALMOST ANY ADDRESS IN AFRICA OR THE WORLD. WE GUARANTEE DELIVERY OF QUALITY FLOWERS VIA INTERFLORA. Please Note: These illustrations are a guide to style and content, flower colour and type. Foliage and containers may vary according to availability. All prices include delivery. An Interflora relay fee of R120 will be added to the total amount. On peak trading days all prices increase by 50%. World wide Interflora relay service to other countries.